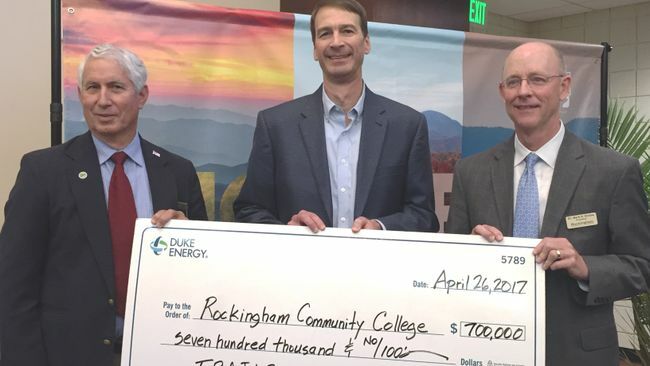 A program to prepare students for careers in outdoor recreation and education will start this summer at Rockingham Community College, thanks to a $700,000 gift from Duke Energy, which is the largest single gift given to a North Carolina community college. “TRAILS is intended to meet workforce demand in one of the five fastest-growing industries in North Carolina,” said Dr. Mark O. Kinlaw, RCC president. Jobs in the industry include forest fire inspectors and prevention specialists; recreational therapists; social and community services managers; conservation scientists; brick masons, block masons, and stonemasons; postsecondary teachers in the areas of conservation science, forestry, recreation studies, and fitness; and grounds maintenance and landscaping workers. Several classes will be offered as early as Summer 2017; under consideration are such classes as First Aid / CPR, Introduction to Wildlife, Kayaking/Canoeing, and Introduction to Trail-building. TRAILS will have trail-building skills as the center of its program, but many other hands-on skills will be taught. “The program will appeal to a wide variety of students because it can benefit those seeking to enter outdoor-related professions, students enrolled in four-year schools, and professionals already working in the field,” said Mara O’Neil, Director of Occupational Extension for RCC. The program will offer certifications such as Wildland Fire S130 and S190, Wilderness First Responder (WFR), Chainsaw S212 or Class B, C-Well Water, Swiftwater Rescue, and Search & Rescue. Other skills to be taught include maintenance and repair of septic tanks and wells, GIS (Geographic Information Systems)/mapping/compass skills, and small-engine repair. Duke Energy’s gift, which includes $610,000 for program start-up costs, will fund the first three years of the program. TRAILS will begin as a continuing education program, with tuition the same price for in-state and out-of-state residents. In the third year, RCC will apply to the State Board of Community Colleges for approval to have TRAILS become an associate’s degree program. Duke Energy is providing an additional $90,000 to cover the difference in tuition in the associate’s degree program for Virginia students compared to in-state residents. “Rockingham County is an ideal place to house the TRAILS program,” said Mark Richardson, chair of the Rockingham County Board of Commissioners. “Conveniently situated to both the mountains and the ocean, the county has the unique distinction of being home to two state parks (Mayo River and Haw River), three lakes (Lake Reidsville, Belews Lake, and Lake Hunt), and four rivers (Mayo, Dan, Smith, and Haw).” The county is also in the very heart of the Dan River Basin. O’Neil developed and presented the proposal over a period of several months to the Dan River Implementation Team, a group of community leaders and Duke Energy representatives charged with exploring ways that Duke Energy could support economic development in the area. The idea turned out to be exactly what the group was looking for, said Mike Dougherty, Director of Economic Development for the City of Eden and one of the team’s members. “The TRAILS program not only will educate students and prepare them for employment, it will also raise the appeal of the Dan River Basin Community as a place to live, work, and visit,” Dougherty said. “Students engaged in trail-building coursework in this program must gain hands-on experience, and the exciting result will be more outdoor assets in this community for residents and visitors to enjoy.